The Etekcity? 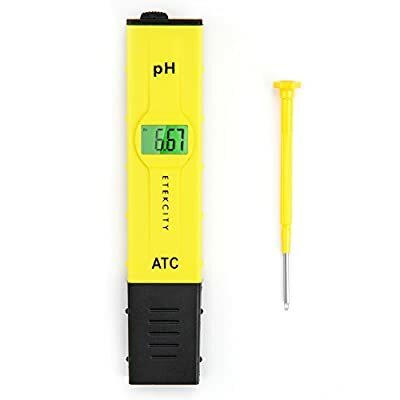 pH meter 2011 is a perfect device for you to test the acidity or alkalinity of liquids. It is very easy to use ¨C just immerse the electrode and you can get the readings. With resolution of 0.01pH and 0.05Ph accuracy, you may get higher accuracy than other pH meters. When ultra accuracy is needed, use the pH 4.0 & 6.86 buffers for calibration. With a standard measuring range of 0-14 pH, the pH meter 2011 is great for a wide range of tasks. An affordable way to test your swimming pool, aquarium, tap water, or appliance water source, you can finally know whether the water you are drinking or using is acceptable for the application. It is also an excellent choice for basic measurements in a laboratory setting. The most important part of a pH meter is the electrode,please try to use it more carefully. Please do not put the electrode directly against any hard surface or wash it with too much pressure. For clean purpose, please gently shake the pH meter in distilled water, in case dash water probably damage the electrode.